Shop Thermotech Digital Medical Grade Infrared Moist Heating Pad (1 ea. )1 ea. 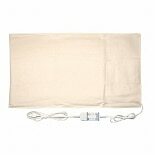 Shop Thermotech Neck & Shoulder Medical Infrared Heating Pad (1 ea. )1 ea.